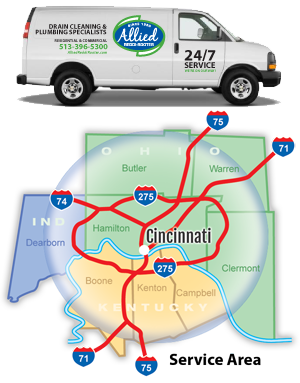 For any water issue, we’re the Cincinnati plumbers you can rely on 24/7. Allied Reddi-Rooter has served Greater Cincinnati residential and commercial plumbing repair customers since 1950. From clogged drains, to sewer repair, water mains, leaking pipes, broken toilets, water heater and sump pump installation, Allied Reddi-Rooter serves you better. Plus, we are restaurant specialists with around-the-clock service. Allied offers free plumbing quotes over the phone for almost any water related issue in your home or business. If you like the price, check our Deals page and you might be able to save even more. For larger work that Allied Reddi-Rooter can’t easily quote over the phone, we’re happy to come to you and prepare a no-obligation, free estimate. We are here any hour of the day with dedicated service to answer your emergency call. If you call us now: 513-821-1141, we’ll be on our way to fix your plumbing problem in a hurry. Our Allied team members average 15 years experience in Cincinnati plumbing repair. As a result, each member is highly trained, knowledgable, efficient and courteous as is reflected by our A+ BBB rating. Can what happened in Flint happen in Cincinnati?